A boy that has escaped from home hears, crouched at the bottom of its cache, the screams of the men who seek him. But when the game goes, what is before him is an inﬁnite and arid plain that he must cross if he wants to move away forever from what made him ﬂee. One night, his footsteps meet the ones of an old shepherd. From that moment nothing will be the same for neither of them. 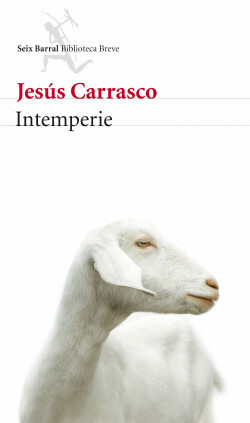 Intemperie tells the ﬂight of a child through a drought-stricken country ruled by violence. A closed world, without names or dates, where morale has escaped down the same drain that took the water. In such a scenario, the child, not yet quite ill-fated, will have opportunity to learn the painful rudiments of judgement or, conversely, exercise forever the violence with which he grew up. Harvill Secker (World English), Robert Laffont (France), Salani (Italy), Klett-Cotta (Germany), Meulenhoff (The Netherlands), Cappelen Damm (Norway), Am Oved (Israel), Bertrand (Brazil), Marcador (Portugal), Nexus (Korea), Magveto (Hungary), Delidolu (Turkey), Crown (Taiwan), Shanghai 99 (China), Swiat Ksiazki (Poland), Tiderne Skifter (Denmark), Natur & Kultur (Sweden), Akropolis (Czech Rep.), Hayakawa (Japan), Goga (Slovenia), Fan Noli (Albania), Uniscorp (Bulgaria), Heliks (Serbia), Calvaria (Ukraine), Tri Publishing Centre (Macedonia), Greece (Antipodes Publications), Fabriikki Kustannus (Finland). Film Rights sold to: Morena Films.